I recently read a straight talking blog by Barry Smith that made me laugh out loud and made my day. You see I think teaching is really hard and that education is the most complex of industries. And to be good in teaching, to be paid for it as a professional demands of individuals that we practise hard to get better. My metaphor is golf. As I don’t have time to practise and begrudge even more paying for lessons, I have been looking for that golf video, magazine, hardware ball, club or swing-aid to bridge the gap. And guess what, ‘it’ does not exist – there is no substitute for 10,000 hours under the gaze of someone who knows what to look for. ‘Resolve never to quit, never to give up, no matter what the situation’. ‘The Road to success is always under construction’. ‘The harder you work, the luckier you get’. This Autumn term, we have certainly all worked harder than even our busy schedules might have suggested; competitions, festivals, fixtures, shows, concerts, a multitude of events for both young and old. Somewhat unfortunately for me personally, I ‘crashed’ metaphorically and had to bed-rest for 2 days in December, missing Art on the Street, the major way we sponsor/support Arts in Maidenhead. Surfacing from the duvet, but still useless for anything worthwhile, I caught up on some reading around education matters. It seems from the briefings around Nicky Morgan, Education secretary, that she is not best pleased with her predecessor’s ongoing interference in her department’s affairs. As chief whip, Michael Gove is to advise David Cameron on all matters on the run up to the general election in May. And part of that briefing must be to highlight the government’s successes in Education since 2010. And therein lies the problem, because this unproven, radical agenda to nationalise education under the academies’ and ‘free schools’ programme will take a decade to prove itself. In the meantime, reducing local authority powers to the bare minimum for the coordination of special needs management, whilst disabling their ability to build schools where they are required, has already ensured a catastrophic loss of capability, knowledge and experience within our Town Halls. Perhaps that is what is intended, because local authority infrastructure is expensive, and often managed by different political parties and thus at variance to the views of the national government of the day. So here we are, on the cusp of 2015, a time when Resolutions To Do Things Better are made. Here’s my 6 ideas on how we might collaborate more effectively across the political and educational spectrum over the next 12 months. 1. Support the development of a (Royal) College of Teaching, along the lines of the other Royal Colleges that assist in informing their profession, such as Surgery, Psychiatry, Pathology, Music and Art. We can’t always agree on what works best, but we can build a body of professional knowledge and evidence that supports teacher and curriculum development within the UK. 2. Focus schools once again on the importance of being both Academic institutions and Educational communities in the wider sense. Children deserve educational provision that encompasses a broad remit, that qualifies them for their next steps in education through academic endeavour and includes opportunities for acquiring new skills and developing them to a very high level. 3. Put an upper limit on the League table success – such that above that the vanities of small differences don’t continue to drive school leaders on the futile quest to be ‘the best’. So for example, if at primary level the target is for 85% of children to be both literate and numerate to a bench mark assessment, acknowledge that the schools do that, but not report the stats beyond meeting the target comfortably (say +5%). This then permits schools that make the target then to utilise what resources remain to after school clubs and activities and so forth. 4. Giving the right for 1 boy and one girl from any sixth form to access an Oxbridge place, subject to appropriate A level success, and separately a Russell group place, and separately medical school would ensure that those institutions would naturally collect from the broadest talent pool and ensure an elevator effect for those most capable on societies fringe. 5. Build a coalition of support in the Fortune 500 companies and in public service to ban the provision of unpaid internships, and commit to the provision of paid internships that follow the rules in 4 – in short, opening up experience to the widest possible talent pool. We are not going to be able to solve the access issues that have become even more polarised to the most fortunate in our society over the past 5 years, but we can at least strive more effectively to do better. 6. Dramatically upsize the training and support available for qualified graduates to switch into medicine and the science/technology disciplines. Graduate debt is at such a scale now that only those who are wealthy can contemplate the second degree. Yet University is often wasted on the young and mature entrants will almost always be more focussed and committed to their chosen vocational career and we need those extra skills more than ever. What is interesting for me as I watch our undergraduates prepare for a life of employment after University is their sheer breadth of skills they are able to deploy into the market place. Most can speak very comfortably, they know how to persevere and be stoic when things don’t go their way, they’ll take risks and turn their hand to something new, and above all they’ll travel to take up the opportunity. Here’s a recent extract from a past pupil my wife Jenny and I taught in the Eighties, Gary Kung, whose family had emigrated to the UK from Hong Kong to find for their family brighter opportunities in the UK. “I was the pupil who played the piano well, and who started using a keyboard at Claires Court during the school play.Back then your youngest son was only a baby, and Mr. Gobs was the music director, Mr. Porter was teaching French, and Mr. Wells and yourself teaching Biology. 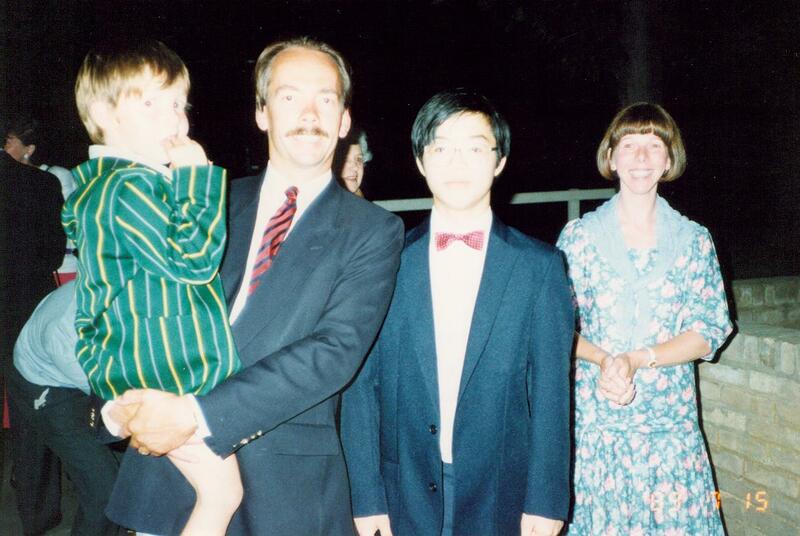 Attached are a couple of pictures of me in 1989, and one last month, with my family. I moved from Hong Kong to the UK in 1984, and my English was very poor then. I can’t thank you enough for providing the chance for me to study at your school, where I matured and thrived. I then studied at Wellington College Crowthorne for the A levels. After graduating from studying medicine at The University Of London in 1998, I went back to Hong Kong and never came back.I am now a general doctor, married with 2 girls of 4 and 7”. There were no entry exams Gary could have passed in 1984 for secondary school; he was a very talented young pianist, but English and Maths were certainly not strong, and other learning in UK subjects almost non-existant. 5 years with us allowed Gary to become fluent in English and sufficiently academic across the curriculum to pass his GCSEs well. Without our own Sixth Form in those days, Wellington provided a natural choice for his Sixth Form, clearly (despite scholarship support) a further severe financial challenge for his parents, but one that has so obviously paid off in the long term. Gary’s early successes at Claires Court were in performing in public, and Richard Gobs, our DoMusic in those days made sure Gary was continued to be challenged throughout his time with us, becoming a virtuoso soloist by age 16+. If we had focussed solely on the academics, then Gary would have not even reached first base. But Gary knew how to work, he used his experience and diligence from practicing piano to very good effect to master mathematics and sciences, and he knew how to use failure to motivate himself to succeed next time. Now Dr Kung, I have no doubt that he believes in the Player mantra linking hard work to luck. Yes, we all need a break from time to time, but when it came for Gary Kung, he worked hard to make the most of the opportunity! Since Gary’s time, achieving places at Medical school for those suitably qualified has become increasingly difficult, and this rationing of provision is doing no-one any good at all, least of all the NHS that remains starved of doctors and has to trawl the other nations of the world to keep our Health Service staffed. That clearly cannot be sustainable for us, or indeed moral in terms of robbing other countries of the doctors and health workers they need. Hence my call in suggestion 6 for a major expansion in post graduate access courses. I guess nothing will happen until after the next election, but I can but hope. In the meantime, Gary is visiting with his family over Easter, and I look forward to catching up with him and his family then, 25 years on since we last met! This entry was posted in Uncategorized and tagged Gary Player, Michael Gove. Bookmark the permalink.